One easy way to get your finances organized easily is with a monthly bill payment checklist. Jot down all the bills that come through in a typical month and organize them by due date. This simple spreadsheet is a perfect overview of your monthly bill payments and can help you more easily manage your account balances. This free printable follows after our free family budget worksheet that helps you track your monthly expenses in a month-to-month format. Head over to grab that free printable, too! To use this budgeting checklist, start by gathering all of your bills. Write down your bills starting with those due on the 1st of the month working your way through the month writing down bills in order by the date the payment is due. If helpful, you can also record when your expected paychecks will come in and check them off as well to track incoming payments. As each bill is paid, you can check off the box by the corresponding month. There are twelve circles – one for each month of the year. During the month, you can refer back to the checklist to see what bills are still coming up and plan and budget accordingly. One key product I recommend is hole punched pocket dividers. These are wonderful for storing your receipts and bills until you can file them away at the end of the month. To get your free copy of the monthly bill payment checklist, just click on the link or on the image above. Just print out your free bill pay checklist and get organized with a simple binder planner system to keep all your files organized. Also grab our first free budgeting worksheet a Family Budget Worksheet! 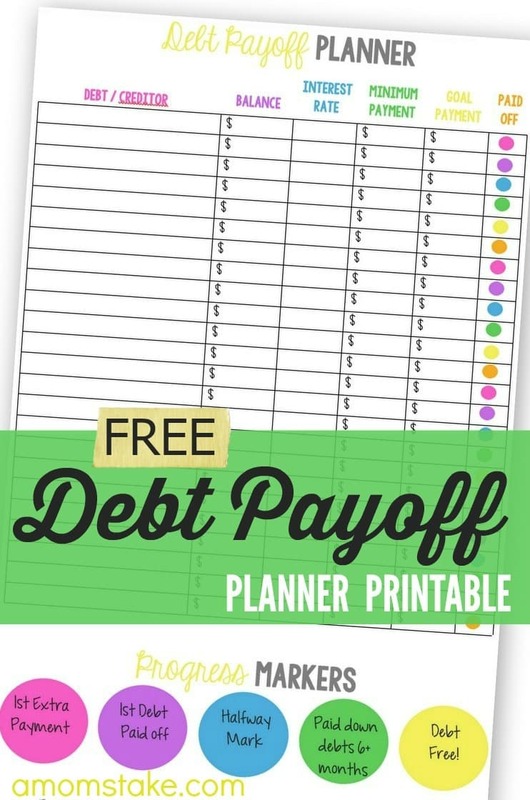 For another way to quickly payoff debt, turn to our free printable Debt Payoff Planner! Build savings into your financial plan to have an emergency fund on hand for the unexpected. You can easily save $1,000 in less than a year by just saving a little each week. I’ve tried other bill paying printables but did not keep them up. This one is so simple to use and nice and colorful. I always think I’ve paid a bill and end either end up being late or skipping a month. A little check mark and I’ll know for sure. Thanks for the ease of use on this printable! I love how colorful and pretty this is. A nice way to add a bit of cheer to the dreariness of bill-paying! Found it at the Wonderful Wednesday hop – pinned. Thanks!! Great tool! I like the multi-colored checklist section. Brilliantly simple, elegant design. Thanks for sharing! That’s a fantastic idea. I wish I’d have come up with this idea before. No more late fees, right!? Thanks for the idea and the free printable. I love the design and colors! My children are adults now and I am trying to help them learn to be organized and responsible. This will hopefully make it easier for them to keep track of things. Very useful, well thought out and helpful. I have a notebook I keep all my bills in. I list mine by due date (date paid)/bill name/amount paid/how paid (check, bill pay, etc) and confirmation code. That way when someone calls and says this bill wasn’t paid I can look in the book and say it was paid this day, this amount, and this is the confirmation code. This is great! I love free printables that make life easier! I really like this idea. It makes it easier to check and make sure you’ve paid a certain bill that month. I’m showing this to my son who has been looking for a system like this. Thanks for sharing! I use a very similar system for keeping track of expenses. I do mine in an Excel spreadsheet though, as I have no need to print it. I have found keeping a list lie this keeps me more accountable for paying bills. Great checklist!! This is really a great idea and sure could come in handy. Awesome colorful checklist, great way to keep on track and maintain everything. This is nice and convenient. I am printing this Monthly Bill Payment list to help me remember my bills and check off to see if they got paid. I have forgotten before and that is not good.Thanks for sharing.